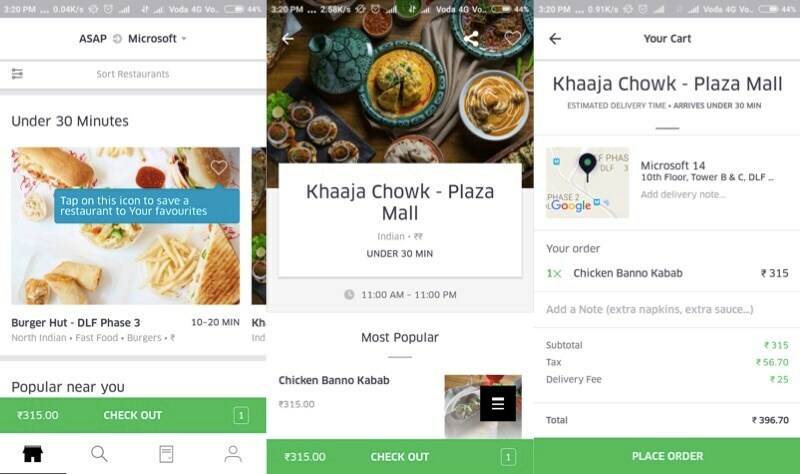 Uber’s food delivery service UberEATS – which works like Swiggy in that orders are delivered to customers by UberEATS and not the restaurant “partners” – first launched in Mumbai at the start of May, has now expanded to its second city in India, launching in Delhi-NCR, the company announced on Wednesday. More accurately, it’s only available in Gurugram for now, with a little over 300 restaurants on board, although the company says that it plans to expand into the rest of Delhi in short order. UberEATS is run as a parallel business to Uber – the deliveries are not carried out by the taxis on its platform; instead, it has built up a parallel fleet of two wheelers that delivery “partners” use to pick up and deliver the food. Uber charges a commission from the restaurants that are handling the order, and pays a fixed pickup fee, and a delivery fee based on the time and distance required for the order, Rathod explained. For customers, there are two ways to order food via Uber. Via the Uber app, Rathod explained that if you’re in a car and want to get food delivered by the time you get home, you can scroll through the cards on the Uber app, and you’ll see an UberEATS prompt. This will default to delivering to wherever you’re headed, and show options that can deliver at around the same time as your arrival, he explained, although you can of course change the location and timings and pick other restaurants. Beyond that, there is also a standalone app for Android and iOS called UberEATS, which functions a lot like any other food delivery app. When you first launch the app, it’ll ask if you want the delivery right away, and take your location. The next page shows you the restaurants available. You can change this by tapping on the location, displayed at the top of the screen. You’ll see lists such as restaurants that deliver in under 30 minutes, what’s popular around you, or you can search for restaurants with a variety of filters, as you’d expect from any app. Ordering is likewise straightforward and familiar to anyone who has used a food ordering app. Payments can only be done via Paytm, for now. Given the limits on wallets without KYC, this might prove to be a bit of a stumbling block. The food delivery space has a few established players already, such as Zomato Order, Swiggy, FoodPanda, to name a few, and many restaurants are also preferring to build their own online presence, rather than relying on any aggregator. However, Rathod says that food delivery in India has the potential to be a huge market, and it’s just in its nascent stages, and thus Uber doesn’t see the existing players as a major concern, he says.